In a small skillet over medium-high heat, cook onions in butter for 5-8 minutes or until the onions begin to brown, set aside. 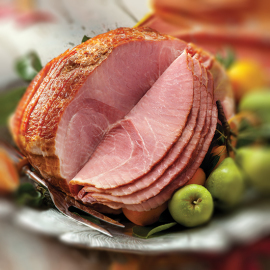 in a large nonstick skillet over medium-high heat, cook the ham for 2 minutes on each side or until lightly browned, fold and set aside. 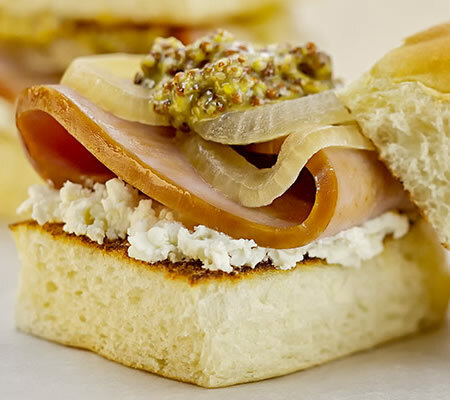 To make one sandwich, spread 1 teaspoon of goat cheese on bottom bun, followed by 1 folded ham slice, top with 2 tablespoons of caremalized onions, 1 teaspoon of grainy mustard and crown bun. Serves 4.